St. John's York Mills Anglican Church once more presents MusicFest. and the Trans Siberian Orchestra. For tickets call 416-225-6611, e-mail or visit on the Web. 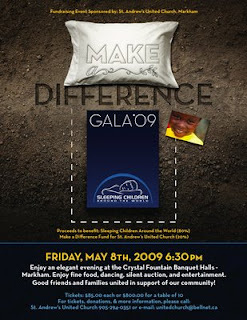 80% of the proceeds to benefit Sleeping Children Around the World. Enjoy an elegant evening at the Crystal Fountain Banquet Halls, Markham. Enjoy fine food, dancing, silent auction, and entertainment. Good friends and families united in support of our community! Tickets: $85 each or $800 for a table of 10. Click poster to see a larger version. A peaceful night sleep might be the reflection of satisfaction, contentment and happiness. But what about the scores of under privileged who are deprived of this very basic right? And indeed it is this ‘good night sleep’, that if provided to the children from economically backward areas, can show them a better morning and bring a sunrise of hope in their lives.